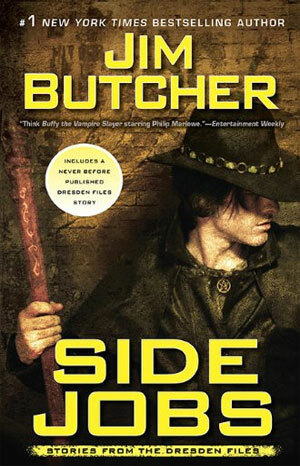 I’ve just finished listening to Jim Butcher’s Side Jobs, which is a collection of short stories that take place between various books in his series, The Dresden Files. It also includes a novella that takes place immediately after Changes, the 12th and most recent installment in the series which left fans either despairing or howling for more and speculating as to what would happen in book #13, Ghost Story, which is set for an April, 2011 release. Here, together for the first time, are the shorter works of #1 New York Times bestselling author Jim Butcher–a compendium of cases that Harry and his cadre of allies managed to close in record time. The tales range from the deadly serious to the absurdly hilarious. Also included is a new, never-before-published novella that takes place after the cliff-hanger ending of the new April 2010 hardcover, Changes. This is a must-have collection for every devoted Harry Dresden fan as well as a perfect introduction for readers ready to meet Chicago’s only professional wizard. Witty, indeed. I’m a big fan of the humor Jim Butcher writes into Harry’s stories and as far as audio books go, I love the way Jim Marsters reads. He infuses so much character into… well, the characters, and instills in them such personality that I much prefer listening over actually reading when it comes to this series. Harry’s many and varied snide comments are a treat to listen to and elicit many a chuckle and to be honest, quite a lot of guffaws, titters and the occasional full blown belly laugh. Listening to the short stories in this book was like revisiting old friends. Besides the laughter, many tears were warranted on certain stories, namely one featuring Michael Carpenter, Harry’s friend and former Knight of the Cross and another that concerned Harry and Karrin Murphy, who works for Chicago PD’s Special Investigations Unit but most especially, the final addition to the book, Aftermath. The novella takes place immediately after the end of Changes… it literally starts within a couple of hours of Harry plunging into the freezing waters of Lake Michigan. It’s told from Karrin’s point of view and yeah, I got emotional a few times during the course of the story and it made me very anxious for April, and the release of Ghost Story, to arrive. In the meantime, I plan another re-listen of the entire Dresden Files series as I must refresh my memories of a few things before April. I’ll be here to write my thoughts on each book as I go. This entry was posted in 50 Books, review and tagged 50 Book Challenge, book reviews, Dresden Files, Jim Butcher. Bookmark the permalink. I’ve never heard James be called Jim before, hehe 🙂 It was James Marsters that first got me into The Dresden Files and I’ve been reading the books every since. Can’t wait for Ghost Story!